1. Melt 8 ounces of the chocolate as directed on package. Beat cream cheese, confectioners’ sugar, nutmeg and extract in large bowl with electric mixer on medium speed until well blended and smooth. Add melted chocolate; beat until well mixed. Cover. Refrigerate 4 hours or until firm. 3. Coat only 12 truffles at a time. Melt 4 ounces of the remaining chocolate in small microwavable bowl on MEDIUM, 1 1/2 minutes, stirring after 1 minute. Using a fork, dip 1 truffle at a time into the chocolate. Place on wax paper-lined tray. 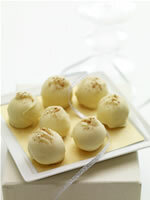 Sprinkle truffles with nutmeg. Repeat with remaining 4 ounces chocolate and remaining truffles. 4. Refrigerate 1 hour or until chocolate is set. Store truffles in refrigerator up to 1 week. Test Kitchen Tip: When dipping the truffles, do so in 2 batches (as directed above in Step 3) as the coldness of the truffles may cause the melted chocolate to harden.